The following graph illustrates the importance of pricing a home when you sell. I don't know who created it, but, the information provided in the graph is timeless. I have seen it happen time and again.The graph explains the percentage of buyers who will buy your house based on the asking price vs. market value. For example, I currently have clients who are searching for a home with specific criteria in a determined price range. Their criteria is four bedrooms, two baths and room for an office, with a price range between $150,000. and $175,000., in a particular area of town. They are from out of town, so I search every home online and send to them. More importantly, they are searching the entire Indianapolis Property Listing inventory on their own and send me homes they want to see. Once they have chosen the homes they want to see, we head out on a home tour. If you have a home which matches their criteria and you are above the price range, you will be eliminated. I do run a search for overpriced homes up to about 5-8% over their price range, When I find homes which have been on the market for awhile, I include those on the tour also. If they are new to the market and overpriced, we usually skip them. There is too much inventory to see all the homes which are overpriced. 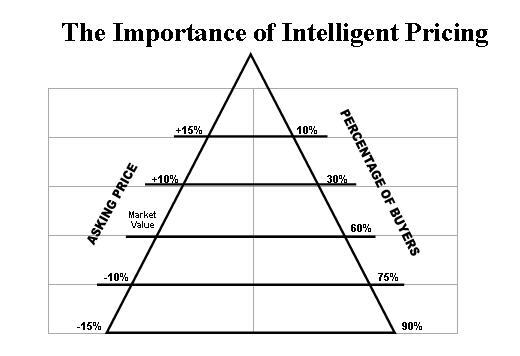 You can see by the graph, when priced at market value, you will attract 60% of the buyers in that price range. Price your home too high and you lose buyers. When priced below market value, you attract a larger pool of buyers. Many homes which are priced correctly are those which have been on the market for awhile and have reduced their price, sometimes more than once. This strategy will work against you. Buyers always ask how long the home has been on the market. Buyers know they have room for negotiating the price when the home has been on the market for awhile. Price it right in the beginning and you will sell quicker and for a higher price than reducing the price gradually. Once your home becomes 'old news' you will have a harder time getting top dollar.